After filing 13 stories on the West Virginia Teacher’s Strike and finally 14 stories on the #PA18 special election, I really needed a vacation (especially considering that I canceled mine in August to file 15 stories on the Nissan union election). Now, we need your help to go cover the Oklahoma Teachers’ strike on the ground beginning April 2nd. We have to raise $1,200 to afford the flights, hotels, rental car, and gas that will allow us to cover the strike. Inspired by the teachers’ strike in West Virginia, teachers in Oklahoma, who are the 49th lowest paid in the country, have threatened to strike on April 2nd unless they receive a raise of $10,000 a year and their school support staff receive raises of $5,000 a year. 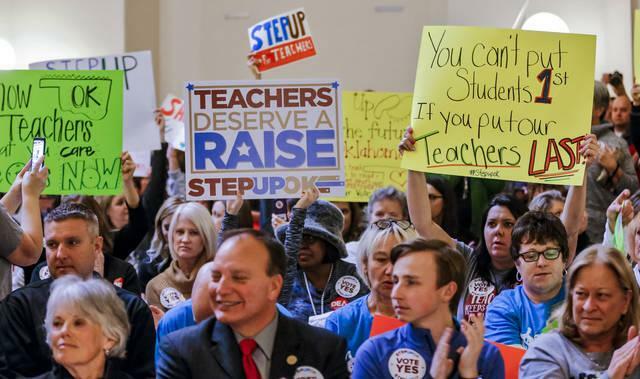 With teachers throughout the country engaged in increasingly militant actions after the victory in West Virginia, the fight in Oklahoma could be a turning point for the national labor movement. As a labor publication, Payday works to report and define labor news for our 900-plus donors — dues-paying members who number among the most influential people in the labor movement. We need to be on the ground in Oklahoma just like we were in Mississippi during Nissan, in West Virginia during the West Virginia teachers’ strike, and throughout the entire congressional district during the #PA18 Special Election. But we need you as readers to pitch in and help us raise $1,200 so we can pay for gas, hotel rooms, rental cars, and taco-making supplies. (I’m still just a taco making apprentice, so who knows how many tortillas I may burn!). So pass the hat, spread the word, and get Payday to Oklahoma. Donate. Be the first to comment on "Help Payday Travel to Cover Oklahoma Teachers’ Strike on April 2nd"